Deaf clients give their approval on the appropriateness of a model's dress during a fashion show at the Evaluation Center. This was also a chance for the clients to learn how to interact with hearing individuals. Although there were plenty of interpreters, there were times when the staff, hearing clients and the Deaf clients had to figure out how to communicate. One of the things that the staff quickly realized was that the Deaf and hard of hearing clients face many of the same challenges as any other client, such as high blood pressure, orthopedic issues, or diabetes that need to be addressed. “For some, those may be bigger barriers to employment than deafness,” says Cato. The pilot program was encouraged by Commissioner Neal Getsinger, who wanted to have a special program at the Evaluation Center for VR clients who are Deaf. VR partnered with the SC Department of Mental Health Deaf Services, SC Association of the Deaf (SCAD), and SC Interpreting Services for the Deaf. They helped train staff leading up to the two weeks and then taught several classes for the clients. VR counselors Amelia England and Jason Hurdich also assisted with the program. “I'm going to miss being here because I want to learn more,” says Daisy Francis. The staff call Daisy “superstar” because of the way she helped facilitate communication between everyone. 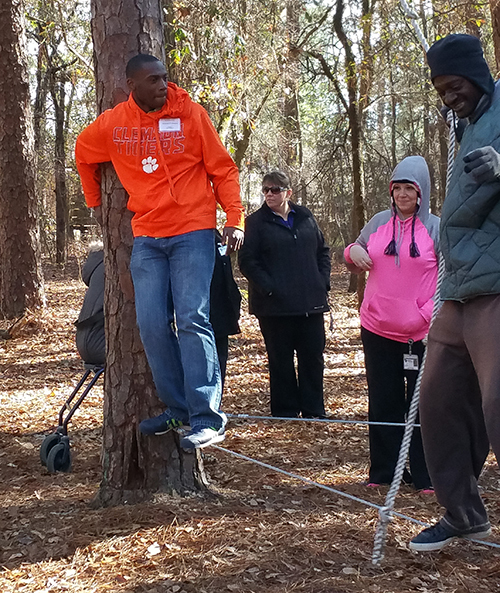 Deaf clients learn team-building skills on the ropes course at Wil Lou Gray. 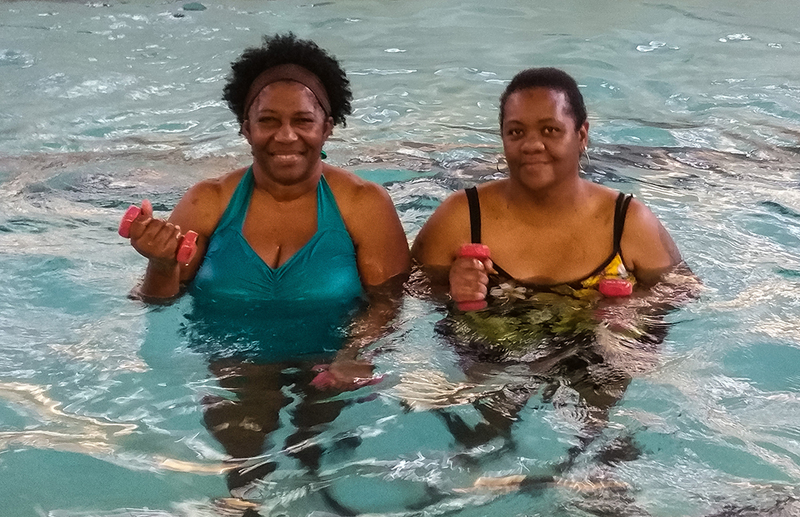 Daisy Francis and Zina Hill participate in aquatic therapy at the Muscular Development Center. Brittany Jenson, Vocational ACE (center) with clients (left to right) Andrea Fludd, Kenisha Hann, Daisy Francis, and Kekeisha Patton. Shonna Magee, Deaf and Hard of Hearing Coordinator (standing), and Kayla Wright, Occupational Therapist (center, seated), lead a class for Deaf clients at the Evaluation Center.